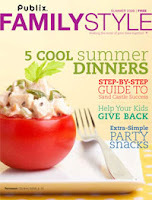 Publix shoppers, sign up for a free one-year subscription to Publix FamilyStyle magazine, an upbeat and fun magazine for parents. You must live in Florida, Georgia, South Carolina, Alabama or Tennessee to receive this magazine and you’ll receive one issue each quarter – in February, May, August and November. Thanks, $30 Weekly Grocery Challenge and Erin over at couponcravings! Plus, don’t forget that you can also get a free one-year subscription to Publix GreenWise Market magazine, which focuses on the benefits of a natural and organic lifestyle. Your four free issues will arrive in January, April, July and October.